You know you have those questions. Those questions that you’ve had forever, but don’t really feel like asking, because you’re afraid of the answer you’ll get. Or that you won’t get an answer. The questions that the Bible and traditional Christian theology don’t do a good job of answering…well, Tony Jones has been running a blog series called The Questions that Haunt Christianity, and it’s been a place where people have been able to ask just those types of questions, and Tony has been responding to them. If you’ve been following along, you’ll see that it’s been a really intriguing series. 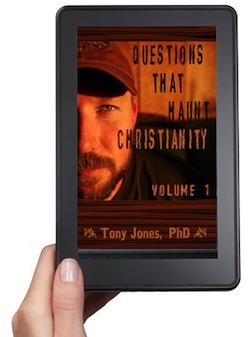 And now it’s available as an ebook: Questions that Haunt Christianity: Volume 1. Why would a perfect God create an imperfect universe? Will I retain my memories in Heaven? Theologian Tony Jones tackles these and other questions — real questions from real people — in the first volume of his series, Questions That Haunt Christianity. Jones delivers thoughtful, commonsense answers and provokes serious conversation about issues from the most abstract to the commonplace. I know a few people who have used the questions that came up in this blog series as discussion starters for their youth groups, Theology Pubs and other groups that might be interested in some deep conversation topics. And for only $2.99, it’s a great resource to have. You can pick it up here.